Theo Epstein saved the Red Sox. Now he’s rescuing the Cubs. Here’s how. First, Theo Epstein saved the Red Sox. Now he’s rescuing the Cubs. Here’s his secret. Chicago Cubs President of Baseball Operations Theo Epstein before Game 3 of the NLDS against the San Francisco Giants at AT&T Park on Oct. 10, 2016, in San Francisco. There are only so many owners and executives in the Baseball Hall of Fame. Tom Yawkey, who owned the Boston Red Sox from 1933 until his death in 1976, is one of them. When Chicago Cubs President of Baseball Operations Theo Epstein is inducted, which will surely happen if his team beats the Cleveland Indians in the 2016 World Series, it would be fitting if there was a parallel action to take Yawkey out. After all, Epstein’s career, which already includes breaking baseball’s other multigenerational championship drought, will have served as the ultimate corrective to the incompetence of people like Yawkey, who were responsible for “cursing” these teams in the first place. Given that Fox’s World Series broadcasts will inevitably refer to the combatants’ long championship droughts approximately once every 3.5 seconds—that’s since 1908 for the Cubs and since 1948 for the Indians—it seems almost cruel to mention them now. Yet the Cubs’ drought, which stretches back to the Theodore Roosevelt administration and through two World Wars, includes seven trips to the World Series between 1910 and 1945, and spans the complete lifespan of Ernie Banks, is key to understanding Epstein’s unique résumé. Other general managers have won championships in two cities. But no one in baseball history has slayed the dragons that Theo Epstein has slayed. A graduate of Yale University, Epstein spent the early part of his baseball career associated with Baltimore Orioles and San Diego Padres executive Larry Lucchino, under whom he rose to be director of baseball operations for the Padres while still in his mid-20s. Warning: If anyone’s life story is going to make you feel like an underachiever, it’s Epstein’s; he earned a law degree at the same time he was rising through the Padres organization. In December 2001, John Henry became principal owner of the Red Sox, his group buying the franchise from the trustees of Tom Yawkey and his late wife Jean. Lucchino, who was named the team’s president and CEO, brought Epstein to Boston, first as assistant general manager and then, after Billy Beane declined to come over from the Oakland A’s, as general manager beginning in November 2002. He was, at a month shy of his 29th birthday, the youngest GM in major league history. Within two years he became the youngest GM to win a World Series. He picked up a second championship in 2007. After a few dry years, he left to join the Cubs as team president in October 2011. 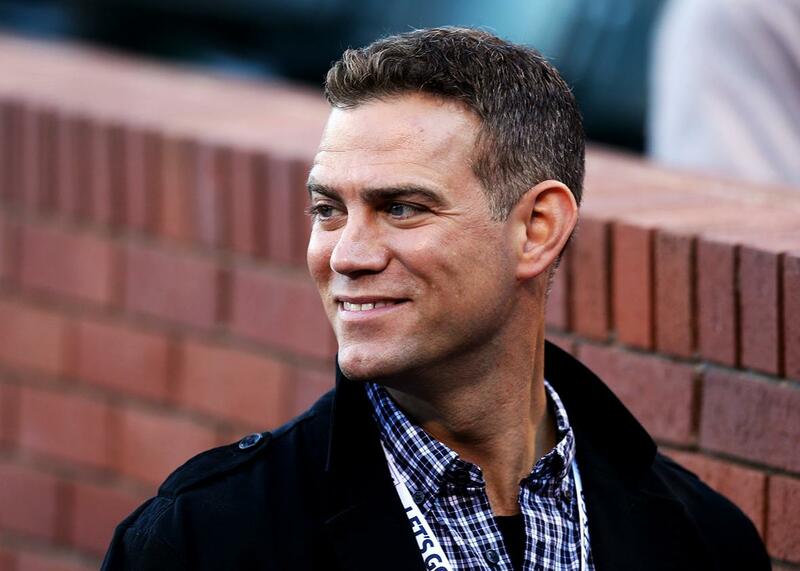 (Jed Hoyer, who worked with Epstein in Boston, came with him to Chicago to serve as the team’s general manager. The two men work in concert to make personnel decisions.) Now 42, he’s in a position to win a third World Series at an age when most GMs are just getting started. When looking for a magic Epstein formula—a simple way of answering the question, “How did he do it?”—it’s important to note that the Red Sox and Cubs were in very different conditions when he got hold of them. The Red Sox, who had mostly been run by GM Dan Duquette since 1994, were in no way a losing franchise. You have to go back to the 1950s and 1960s, when Yawkey—sunk into alcoholic disinterest, resistance to integration (the Red Sox were the last team to break the color line, doing so only in 1959, 12 years after Jackie Robinson), and resentment that Boston wouldn’t build him a new ballpark—allowed the team to drift through 15 years spent mostly in the second division. Since the team’s “Impossible Dream” revival of 1967, which culminated in a seven-game World Series loss to the St. Louis Cardinals, the Red Sox had been either competitive or, failing that, respectable. They’d just gotten some bad breaks in the World Series (see Buckner, Bill), and had suffered from the fact that Major League Baseball has made winning the World Series progressively harder over time, adding new layers of playoffs in 1969 and 1994. The team Epstein took over after the 2002 season had finished second in the American League East with a very strong 93-69 record. Its last losing season had come in 1997, and it hadn’t had a truly terrible season, here defined as losing 90 or more games, since 1966. Conversely, when Epstein took over the Cubs, his new team had lost 91 games that year and had lost more than 90 games five other times since 1997. While the Cubs had gone to the postseason in 2007 and 2008, getting swept out of the first round both years, they’d done so with old teams that had nowhere to go but down. By the time Epstein arrived, the franchise had indeed dropped into the league’s lowest rungs. Back to Boston: Duquette’s Red Sox teams were run by the Yawkey trust as if they were in a small market, with the GM playing the role of a collector of gewgaws and novelties. For most of Duquette’s tenure, he had two great players in their primes, shortstop Nomar Garciaparra and pitcher Pedro Martinez (whom he had acquired), but he failed to surround them with the supporting cast they deserved. He liked to experiment with minor league sluggers like Rudy Pemberton, Izzy Alcantara, and Morgan Burkhart, all of whom (save perhaps Alcantara, who had, ahem, disciplinary problems) might have been finds for a budget-strapped team. To his credit, Duquette did sign slugger Manny Ramirez as a free agent just before handing the team over to Epstein, but the belated gesture didn’t make up for years of noodling with the roster. The Red Sox’s new ownership quickly did away with those old austerity policies. Although Epstein did make use of the team’s wealth to bolster the pitching staff, it would be both reductive and inaccurate to say that Epstein’s successes stemmed from having a bigger budget than his predecessor. In the long term, Epstein’s Red Sox would become perhaps the best organization in baseball at scouting and nurturing young talent, developing prospect after prospect. In the shorter term, he did what the best general managers do, identifying undervalued commodities and acquiring them. Epstein made some initial missteps, such as signing Todd Walker, an offense-first second baseman who was never good enough with the bat to outpoint his clanky glove, and Ramiro Mendoza, a valuable swingman with the Yankees who—jokesters liked to say—was still working for his old team when he put on a Red Sox uniform. The hits, though, greatly outnumbered the misses. Kevin Millar was a 31-year-old four-corner utility man who had hit .296/.367/.504 in five years of more or less daily play for the Marlins, but for some reason they were content to let him wander off to Japan’s Chunichi Dragons. When the Red Sox showed belated interest, the Dragons returned Millar to the Marlins, who simply sold him to Boston. The Minnesota Twins had seen David Ortiz hit .266/.348/.461 over six years of trials and injuries. They didn’t like his approach at the plate, preferring singles hitters (the Twins, who in recent decades have disdained power hitters and strikeout pitchers, have a culture of masochism unrivaled in baseball), and they didn’t want to pay him. He was simply released. Epstein signed him. Bill Mueller was easily overlooked because he was a third baseman who hit singles and struggled to stay on the field due to injuries. He also had a .370 career on-base percentage when Epstein signed him as a free agent. Epstein also dismissed feckless manager Grady Little after a galling Game 7 ALCS loss in 2003 and gave a second chance to Terry Francona, who had spent four losing seasons as the young manager of the Philadelphia Phillies. In the three years since he had left Philadelphia, Francona had packed his CV with several broadening experiences, not least of which was a year spent as a bench coach for Beane’s A’s. Epstein was a kindred sabermetric spirit, and Francona was willing to adapt his methods. It wasn’t a coincidence that upon arriving in Boston, Francona essentially forgot his bunt sign. Epstein also proved willing to make bold moves. On July 31, 2004, he traded Garciaparra, who by that point was a living Red Sox legend. The shortstop, a coming free agent, was beginning to struggle with the injuries that would hinder him over the remainder of his career. The deal brought shortstop Orlando Cabrera, who was in no sense a comparable talent. Epstein, though, had made three perceptive judgments that often elude lesser executives: (1) Today’s championship team can owe no allegiance to the past or it won’t be a champion; (2) The Garciaparra who had won two batting titles no longer existed; and (3) Cabrera wasn’t particularly good, but he could be relied upon simply to be there, something you could no longer say about the incumbent. It’s hard to overstate just how much criticism Epstein had opened himself to had these judgments proved to be incorrect. In 2004, the Red Sox got some of the breaks they hadn’t received in previous postseasons. Whereas, for example, Jim Rice had to sit out the 1975 World Series with a broken hand, in 2004, Curt Schilling pitched through a torn tendon sheath with the help of a new procedure developed by Boston’s medical staff. Schilling’s bloody sock was just the most vivid aspect of an ALCS comeback in which the Red Sox won in seven games despite staking the Yankees a three-games-to-none lead. (After that, the World Series—a 4-0 sweep of the St. Louis Cardinals—was an anti-climax.) That said, to the extent any of this was “lucky,” it was Branch Rickey’s kind of luck, attributable to design rather than happenstance. The ALCS turnaround, for instance, was driven by a huge swing in patience: In the first three games, the Yankees took 14 walks and issued five; over the remaining four, they took 19 but issued 23. And in its extra-inning wins in Games 4 and 5, Boston benefitted from heroic pitching by closer Keith Foulke and home runs off the bat of David Ortiz, both Epstein acquisitions. In short, the manner of victory was Epstein’s, as were the players executing it. Then–Boston Red Sox GM Theo Epstein and pitcher Derek Lowe after beating the St. Louis Cardinals in the World Series on Oct. 27, 2004, at Busch Stadium in St. Louis. The Cubs required a more radical surgery to get to the World Series. But as with the Red Sox, there were basic flaws in organizational philosophy that, once corrected, would translate immediately to wins. The summer before Epstein brought Bill Mueller to Boston, he had been with the Cubs; they had dealt him to the San Francisco Giants with cash for a nonprospect pitcher. The Cubs replaced him at third base by sliding over their second baseman, Mark Bellhorn. Bellhorn, who had come up with Beane’s A’s, was a switch-hitter with power who worked the pitchers. In 2002, he was in the midst of his best season, hitting .258/.374/.512 with 27 home runs and 76 walks. Bellhorn was not a great defender at any position, he wasn’t fast, and he struck out a lot, but if you cared about the basic alchemy of run production—getting on base and driving runners home—he was someone you could use. The Cubs didn’t care. The next year, Chicago hired Dusty Baker to manage the team. Baker claimed Bellhorn had been programmed to be selective and he would have to unlearn that, all the while grousing that players who walked a lot only clogged the bases. Clogging the bases is a good thing, but Baker didn’t see it that way. The Cubs traded Bellhorn to the Colorado Rockies, who passed him on to the Red Sox, where he played a key role on Theo Epstein’s 2004, curse-busting World Series champions. Disdaining players with high on-base percentages was not just a quirk of Baker’s. It was a core belief of the Cubs franchise. Since the National League went to a 162-game schedule in 1962, just 32 teams have drawn fewer than 400 walks in a nonstrike season. The Cubs joined that list under Baker in 2006 and have come close in 12 other seasons, the most of any team except the Los Angeles Angels (13 seasons) and Pittsburgh Pirates (also 12). This year, the fifth of the Epstein era, the Cubs led the league in walks drawn by a wide margin, besting their own league-leading mark of 2015 by 89 free passes. The Cubs’ disinterest in on-base percentage is just one symptom of the team’s desultory approach, which dates back first to Philip K. Wrigley, whose initial hire as general manager upon inheriting the team in 1933 was a seafood wholesaler, and then to the Tribune Company, to whom the Cubs were a not-particularly-interesting line on a ledger. As with the Red Sox, ownership slow-walked integration, which put the Cubs behind other teams in terms of collecting talent. Once in the hole, incompetence and those added playoff rounds kept them there. Now competence—aided by dollars from the Ricketts family, the first owners who seem to care about winning since William Wrigley—has gotten them back out. This offseason, the Cubs signed the patient Ben Zobrist to a $56 million deal and traded away the impatient Starlin Castro. Since Epstein’s arrival, the team has opened its wallet for free-agent starting pitchers Jon Lester, John Lackey, and Jason Hammel—ownership providing Epstein with the cash to bring in the arms the farm system has so far failed to produce. Epstein has also engineered some brilliant trades, credit for which must also be shared with Hoyer: acquiring first baseman Anthony Rizzo, a former Epstein draft pick with the Red Sox, for pitcher Andrew Cashner and a minor league outfielder; center fielder Dexter Fowler for pitcher Dan Straily and infielder Luis Valbuena; shortstop Addison Russell for pitchers Hammel (who later came back to the Cubs) and Jeff Samardzija; pitcher Kyle Hendricks for the dregs of former All-Star Ryan Dempster’s career; pitchers Jake Arrieta and Pedro Strop and cash for pitcher Scott Feldman and journeyman catcher/presumed Trump voter Steve Clevenger. As with the Red Sox, Epstein added a top-flight manager when he could, replacing Rick Renteria with Joe Maddon, and he hasn’t hesitated to trust young players with key roles. 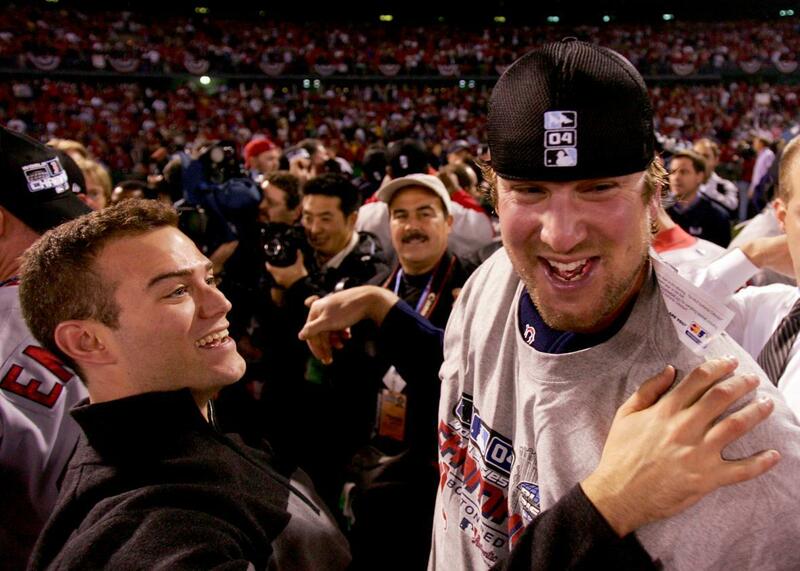 The 2004 Red Sox had one home-grown product on the field during the World Series. The World Series–winning 2007 team, also Epstein’s, had eight. The Cubs are on the same trajectory. Drafting and player development are collaborative exercises involving not just the GM, but scouts and scouting directors, and subsequently farm directors and a small army of minor league personnel. A GM’s role here is to set a tone by defining the kind of players the organization prizes and what skills to emphasize in their training. In Boston, stars such as Jonathan Papelbon, Dustin Pedroia, Jacoby Ellsbury, Mookie Betts, Jackie Bradley, and Xander Bogaerts were drafted or signed on the international talent market during Epstein’s tenure. In Chicago, draftees Albert Almora, Kris Bryant, and Kyle Schwarber have already made their way to the majors, and 2015 first-round pick Ian Happ, a second baseman/outfielder, seems likely to do so in the near future. The thing most of these players have in common is that they’re mostly not pitchers. Epstein has been reluctant to bite on touted arms that might never pan out due to injury. Position players are far more projectable. Bryant didn’t have to go through a Tommy John surgery before becoming an MVP contender. Epstein has taken two very difficult jobs and made them look easy. When you add up his accomplishments, you get a lot of common-sense decision-making yoked to a strong perception of who’s valuable and who’s not. He isn’t an innovator like Branch Rickey or Billy Beane; he’s just very, very good at his job. The Red Sox and the Cubs hadn’t had anyone in his class prior to his arrival. When he arrived in Boston and Chicago, he put good players in place and they did the rest. Maybe breaking a curse is just that simple.